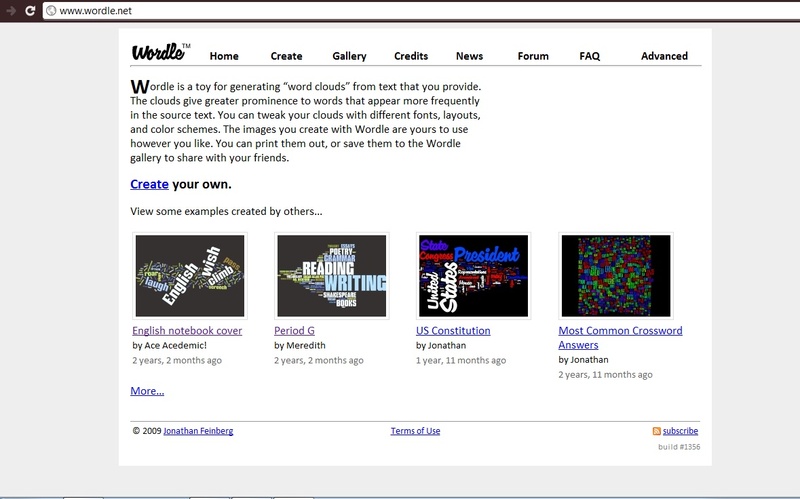 It is a tool to generate 'words clouds' from a text. This tool could be used for analysing and visualising a text. 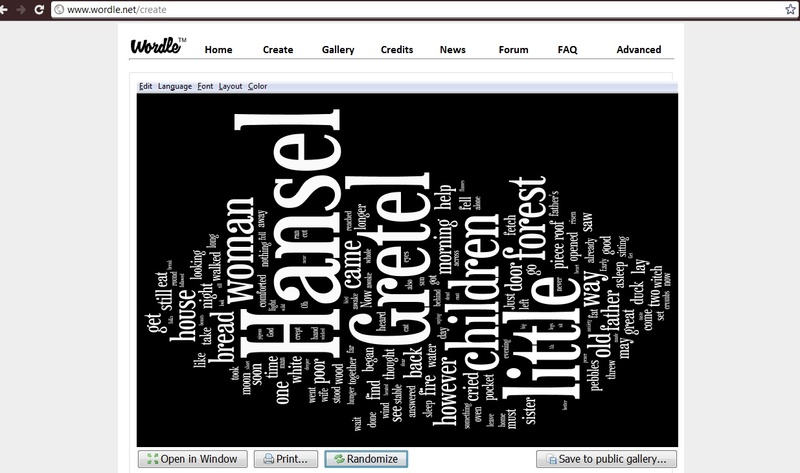 The clouds will show the most frequent words in larger font size and the less frequent words in smaller size. 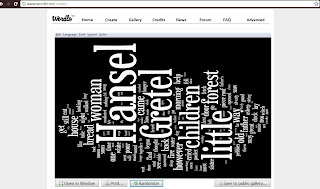 Below is an example of the text cloud that I have made using Wordle. The text is a short story entitled 'Hansel and Gretel'. Pre-reading activity to activate prior knowledge - Teacher can paste the reading text in Wordle and show it to the students. Then, teacher asks the students to guess what the text is about. Elicit speaking - Teacher shows a word cloud and asks the students to give their own opinion about the text. Students may talk about: what the text is about, key points in the text etc. Another option could be that the students work in group and use Wordle for a basis of discussion. In writing essay - students write a draft of an essay then, they can paste their draft and analyse their writing. They can see what are the most words or phrases that they tend to use and it can also help to spot cliche. Could also be used to summarise big ideas of a chapter or passage of a text. For this activity, the teacher could ask the students to work in pairs and use Wordle to summarise the text. Then, some students need to present their summary. Develop critical thinking skills - use Wordle to analyse main ideas, make predictions and to critique and revise essays. 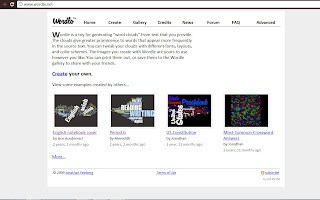 Wordle has a very short memory of the image that it creates - If you forgot to save your Wordle and you open a new image, the image of the old one will lose. Hi... My name is Suhaizura Mustapha. I am doing TESL in University of Warwick. I will use this blog to share new tools and technologies which could be used in the classroom. So, let's have fun with ICT!! !